Yesterday I found out that a polfilter can change the redness or blueness of a spectrum. @stoft said it could be an effect of the glass of the filter. 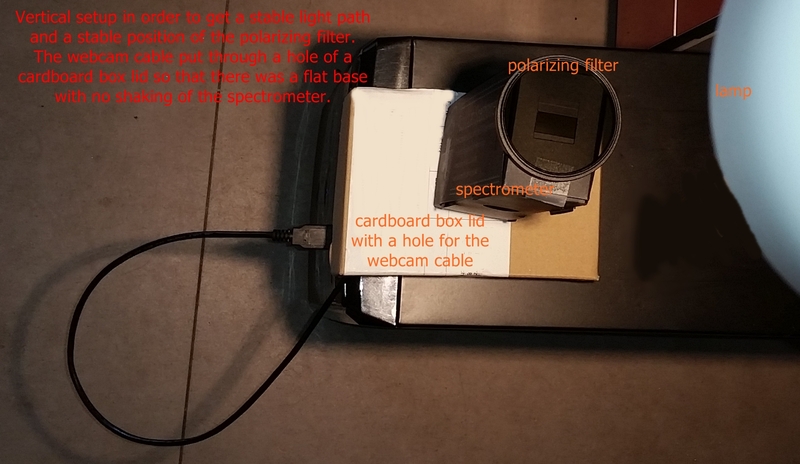 Today I want to check if the turning angle of the filter has any influence on the spectra. The setup is simple: hold the filter in front of the slit, capture a spectrum, turn the filter around by 90 degrees, capture another spectrum, compare. At first glance the curves look pretty much alike. Hills and valleys almost at the same places. But a closer look shows that the dark blue curve is a little bit taller than the light blue one and in some places it seems to have been pushed a bit to the right (red) side. If this effect is reproducible then I doubt that its an effect caused by the glass only. It should have something to do with the polarisation. In the next step I compared the colour channels individually to find out more. In all cases the dark curves (polfilter turned by 90 degrees) "wrap around" the light curves (polfilter upright) and in the blue and green curves we even see the right (red) shift. And then I repeated the experiment a second time to see if it is a reproducible effect. As you can see the effect has almost gone, that means it could not really be reproduced in the second set of captures. The main difference - although a small one - is in the blue range but this might be due to noise problems. Okay, here is the third try. This time I staged everything much more carefully and stable and I took data on two more turning angles. I chose a vertical setup this time so that the polfilter could lay flat on the slit. Final conclusion: the turning angle of the polarizing filter seems not to affect the curve data. All differences detected seem more likely to be due to noise effects. The blue curve seems to get the most noise in this setup. Hmmm.... The noise appears significant enough that to do amplitude comparisons between filter settings I'd suggest taking at least 3 separate sets of measurement data and averaging those before comparing the data. I'm still working on the noise issue and it's a real problem. @stoft: Yes, the second try suggests it is probably more a noise problem. I will re-do the test very carefully and see what a third data row brings up. Here are the data of the second test if you want to have a look.